So as I mentioned in my last post, I just got married. One of the things I do with my husband to keep having fun and share each other’s interests is a book club. We take turns picking books and it can’t be the same genre he picked last or the one I picked last. It’s a lot of fun and we’ve been doing it for a while. I just realized I should be reviewing these books too. So the first one for this year was my pick. 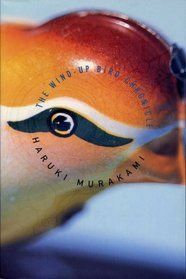 From Goodreads: Japan’s most highly regarded novelist now vaults into the first ranks of international fiction writers with this heroically imaginative novel, which is at once a detective story, an account of a disintegrating marriage, and an excavation of the buried secrets of World War II. Three books in one volume: The Thieving Magpie, Bird as Prophet, The Birdcatcher. This translation by Jay Rubin is in collaboration with the author. I don’t know what I expected when I picked this book up. I’d heard about this book from a few different people and after showing my husband the back cover he expressed interest and I picked it. It was definitely not a book I would usually pick. I’m more into genre fiction and not straight literary fiction. Having majored in English, I’ve read my fair share of literary fiction. Every once in a while I like to go back and explore that world again though and this was one of those times. This was an interesting journey to say the least. The writing is incredibly smooth. By that I mean that I could just devour whole chunks of the book without it feeling like any time had gone by. There was no part of it (except for maybe some war flashbacks) that made me zone out or want to read something else. This is such a bizarre story but I wanted to keep reading and I honestly did find it hard to put it down. I felt so bad Okada and wanted his journey to end well. He was a great main character to share a head with and I thoroughly enjoyed this book. I would recommend it to anyone looking for something new, especially if you’re like me and this isn’t your usual. I think you might be pleasantly surprised. I know my husband was a little nervous about starting it, since he hasn’t ever read anything like this and so far he’s been really enjoying it.